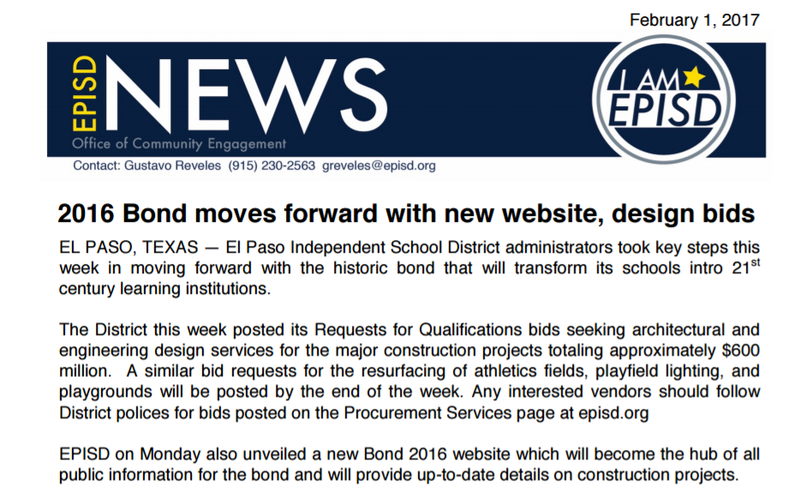 EPISD has generated a lot of publicity about their new web site. Among other things it is supposed to provide local vendors with information relating to opportunities tied to the bond projects. If you take the time to look at their new web site you will see that there is no mention of bidding opportunities related to the design and management of the projects. The district has already signed a $15 million contract with a firm to get them to manage the construction projects. The firm is from out of town. This entry was posted on Monday, April 3rd, 2017 at 5:00 AM and is filed under El Paso Independent School District. You can follow any responses to this entry through the RSS 2.0 feed. You can leave a response, or trackback from your own site. The district is required by state law to award to the lowest bidder. Local considerations cannot be given preference if there’s a lower bid from a non local party. Mr. Weaver can clarify. He can also clarify whether that applies to contracts that fall under the Superintendent ‘s spending authority. Regardless, internal audit and the board have an obligation to oversee his expenses and contracts and make sure audit looks closely at this stuff. The buck stops there. State law generally requires the district to award contracts based on “best value”. There are many ways that they can purchase and the different methods have different rules. Often times the district can use evaluation factors like “past experience with vendor”, “reliability”, “quality of proposal” and others to skew the results to the company they want to buy from. So the district files suit against Banes Contractors and tells the paper that the suit will affect them getting future bond contracts. Sad. … and Dori wants to be our next U.S. representative. If we could only replace the board with people from out of town. The district also buys buses. All of the buses were made out of town. The district also buys desks and furniture. All of the furniture is made out of town. The Superintendent has board given authority to spend up to $100,000 on anything for the district and if the district uses “buy boards” which are mostly out of town except Region 19, Ysleta and Socorro then his authority rises to $250,000 without board approval. Makes him a popular man around the state buy boards! Someone should look and see just what percentage of the EPISD business is given to other that El Paso businesses. But notice the El Paso Chamber of Commerce never complains but rather keeps praising the districts policies. Yes. Incredible. Wait till you see what the city is about to do. Any El Paso Business can become part of a Buy Board. If they are not on them, is that the district’s fault or the fault of the business not taking advantage of a business opportunity? Look at the history of buy boards and see how they have grown since the State said that using them satisfies all state laws concerning bidding rules. Would it be possible for a buy board to be dirty and a school district buying from them? The district would be in the clear unless tied to dirty buy board. Something else the EPISD does, goes out for bid and accepts catalogs to buy stuff from and many of them have the same materials at different prices. Does anyone check to see that the cheapest catalog is being used? Would this allow someone in power to have certain companies getting more business than others with cheaper catalog prices? You figure it out!